If you aren’t already excited about denim, we aim to have you there by the end of this article. The one time staple of the consumer wardrobe is making a comeback, and we want you to be leading it. For a while there denim had a rough ride. Like when video killed the radio star, athleisure murdered Daisy Dukes. But we have good reason to believe it’s on its way back. The industry thinks so too – VF Corp this week announcing it’s spinning its denim business off from its other brands. Wrangler and Lee will now form part of a new company, helpfully called NewCo. Doing that means those brands, which have fallen behind the business’s activewear brands in recent years, get renewed, specialised attention. It’ll put fire under Levi’s and make the wider denim market more competitive. Which is great for innovation. That means you’ve got to be more innovative about your denim assortment too. So we did a deep dive on everything happening in the denim market. Let’s get into it. We looked at new arrivals of jeans over the last four years to understand how the market has changed. The data clearly shows that denim struggled through 2015 and 2016 – peak athleisure. Urban Outfitters and Forever 21 have very clear dips where each retailers’ denim assortments were down. Across all retailers, you can see in the last 18 months that the category has seen a real boost. Forever 21 lifted its newness in the final quarter of 2016 and hasn’t looked back since. Bloomingdales’ growth is steadier, but there. ASOS had a huge 2017 and Urban Outfitters have redoubled their efforts for Back-to-School this year. When looking at jeans by market, we can see even more specific patterns. Firstly, the luxury market, which has seen a huge uptick in the UK market. It gained strength in 2017 and soared in the early months of this year. This is a great sign that new trends will soon flood the mass market and steer consumers to purchase. The growth in luxury is less pronounced in the US, but the mass market there has lifted steadily over the last four years, while the UK is recovering from a quiet 2017. Denim has grown, it’s just leggings, for the moment, outpace that growth. Denim is growing. There is 42% more product in stock so far this quarter than there was this time last year. Regardless of the fact that leggings are growing at a faster pace, for the moment, that is something to shout about. Jeans are a huge category, double the size of leggings and still bigger than categories like blouses and coats. Of course leggings are still gaining – the apparel market is huge, consumers latch onto things at different paces and our lifestyles are more active. But what this shows is that doesn’t have to come at the cost of jeans. Tracking US pricing on jeans shows the average price point has climbed considerably since 2014. Men’s jeans are up 28% to $210.86 this quarter, and women’s have grown 10% to $165.44 – demonstrating it’s the more competitive market. Q3 is historically a trickier time for hitting the higher notes on denim pricing – with Back-to-School promotions making the category especially competitive. Some of the biggest apparel players are still figuring out their denim strategies. The chart below shows how Forever 21, H&M and Zara price their women’s jeans assortment in both the UK and the US. It’s interesting to see that both Forever 21 and H&M shift price emphasis lower for the US market. H&M considerably so. However, Zara, who’s assortment is very focused around a single price point, shifts pricing up for the US market. EDITED Tip: If you have access to the software, why not look at how premium brands are priced differently in different regions, starting with 7 For All Mankind, Citizens of Humanity and J Brand in the US and UK. In the Options chart, set the price point intervals to $100 and see how the regions differ. You got this far, but all you really want to know is – are skinny jeans dead yet? Short answer: not yet. They still represent 58% of women’s jeans in fact. If you’re a denim retailer, skinnies are your core. What is exciting is the movement elsewhere. Cropped, culotte, mom, ripped and wide styles have all gained since 2016. Denim styles are still dominated by the skinny jean. Skinnies, though they account for 58% of the jeans assortment, make up just 41% of best-sellers. Here are some of the most successful from the last three months. Cropped lengths and rips are still very popular. However, those non-skinny shapes have an exciting presence in best-sellers. Meet them here. Whether it’s frayed hem or clean lines, these wider silhouettes which finish above the ankle have been pushed by brands like Madewell and Everlane. Black and white denim has performed especially well. New arrivals of this style haven’t lifted, but its presence in best-selling products has. That’s a clue that consumers want them, and the opportunity is under-explored by retailers. Flared shaping to skinny styles will be the most versatile, but the higher waist, wider cuts bring a refreshing hit of newness. Of course, jeans isn’t the only denim style out there. Outerwear, dresses, shirts, shorts and skirts are all important too. And increasingly so. ‘Other’ denim has grown by 12% in the last month and is the one to watch for Spring 2019. There is a whole lot of innovation happening in denim garments which helps retailers capture a premium price point on categories like skirts and dresses. One recent shift has been print, which has seen a 21% increase in the last three months compared to last year. The outerwear category in denim has grown 101% in the last two years. This summer not only are there strong color stories coming through (oranges, yellow, plum) but prints have arrived. Checkerboard, leopard and snake prints have all featured in matching denim skirt and jacket sets. Cropped or oversized, the denim jacket is a key Back-to-School piece. For fall a borg collar or zip fastening make a great update. Denim skirts have grown 25% and shorts are up 47% from two years ago. 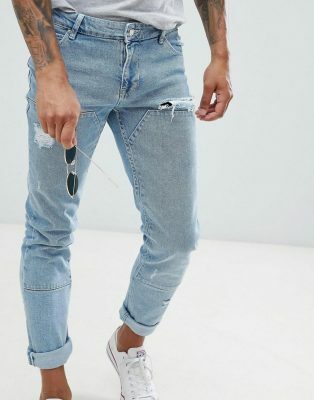 The hottest new direction in non-jean denim is the 90s theme which overhauls these items. Think wider Bermuda style shorts that tap into the whole ‘ugly fashion’ thing and button-through longline skirts. Denim dresses are a great opportunity too, heavily referencing the 90s with pinafore and button-though styles. Play with color and print in these for campaign-leading pieces in Spring 2019. There is lots of room to grow here. EDITED users, stay tuned for your denim Retail Reports coming next week. And if you don’t have EDITED but you want to know more about denim, talk to one of our retail specialists by clicking through here.